Every Knight asks himself, “What can I do to help the Council?” Most Knights will answer that each Knight should use his personal talent(s) to build Church and Community through acts of Charity. That is exactly what Tom Edelen did. Tom is a “returning Catholic.” That is how Tom described himself. He told this writer that he missed the Church. He had tried other churches, but he missed the church of his youth and returned home. He found himself wanting to get involved and contribute. He did just that. He is very active and volunteers for several of the parish ministries, the Men’s Club, and, just two months ago, the Knights. Tom’s favorite project is repairing Rosaries. He would hear others speak of broken Rosaries. Some were family heirlooms, some homemade, some fancy, and some plain but cherished. He had plenty of free time, a few small tools, a table. and a workbench. So, Tom found himself tinkering and fixing a Rosary; then another, and another. Our Knight was now on a quest. He found a talent that is needed and went to work. You will find his calling card at the entrance to the narthex. It is a Rosary Repair Service envelope. Just fill out the form, insert your Holy Rosary and your beads and crucifix are en route to his bench. Tom is expanding his program to include collecting old and discarded Rosaries and their parts. Parts are hard to find and he can use these discards to make other Rosaries whole again. He is not stopping there. He is also championing Our Lady’s Rosary Makers Guild. 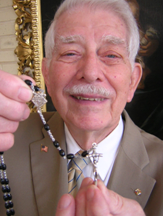 He hopes to start a parish build-a-rosary group for building cord or wire Rosaries. Fifty Cord Rosaries can be built for just $7. It takes 15 minutes to make one. Reprinted from Chapel Hill KnightLine, August 16, 2005 Tom can still be found with a Rosary on his workbench.